Put the chicken in a 12 inch Dutch oven, cover with water and using 8 coals on bottom and 16 coals on top bake at 350 degrees for 30 minutes or until juices run clear. After the chicken is done, drain and keep warm. Wipe the dutch oven clean. In a small bowl, combine the cornstarch, milk and seasonings until smooth. 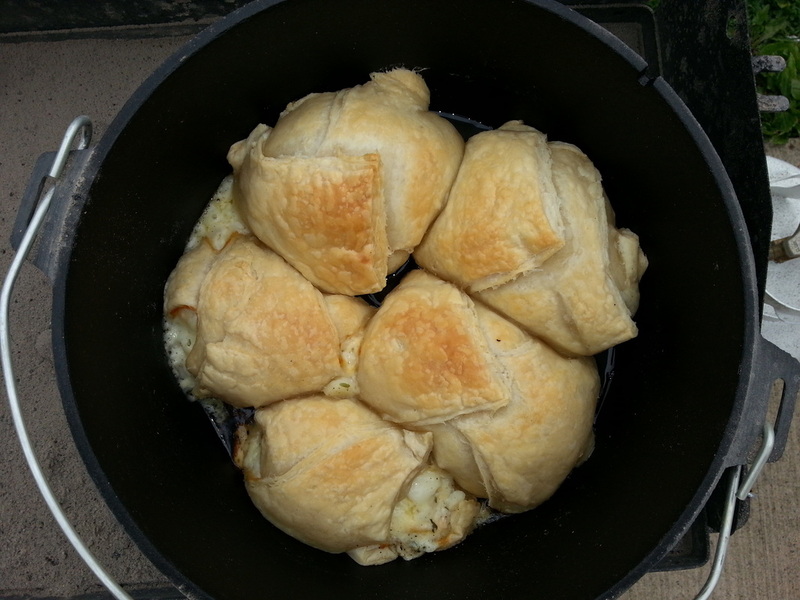 Use a small Dutch oven over full coals and bring to a boil, cook and stir 2 minutes or until thickened. Cut the pastry sheets in half width wise. On one side of each half, place a chicken breast, ¼ cup mixture, two ham slices and 1 cheese slice. Fold pastry over filling and seal the edges. Place each bundle in a greased 12 inch Dutch oven. Using 20 coals on top and 9 under, bake at 400 degrees for 25 to 30 minutes or until pastry is puffed and golden.